New York is one of the states with the largest number of licensed practical nurses, totaling close to 48,000. Even so, the demand for LPNs continues to rise. 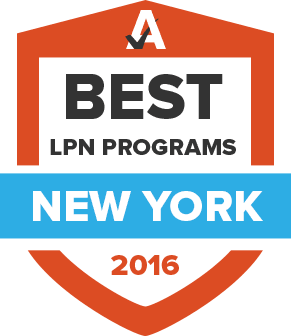 In addition to a promising job outlook, LPNs in New York enjoy annual wages above the national average. Learn more about the steps to become a licensed practical nurse, what the industry growth projections are, and specific requirements to practice in the state of New York. Whether in New York City, Long Island, or upstate, those who want to study practical nursing in New York have several options available to them, including programs at technical schools and community colleges. To narrow down their options, aspiring LPNs can use the search tool below to find a school that meets their location, education, and tuition preferences. Like other states around the country, LPNs in New York are required to obtain a license in order to find employment. These credentials are issued by the New York State Board of Nursing, an agency that regulates the nursing profession. This section provides information on the licensure process, from education to license renewal. Licensed practical nurses are required to complete a state-approved program that lasts at least nine months. In addition, license applicants must take an infection control course that has been approved by the New York State Board of Nursing to ensure they understand how to prevent the spread of diseases like HIV and hepatitis B. The New York State Board of Nursing requires that LPNs go through the licensing renewal process every two years. These professionals must take continuing education classes that cover infection control and child abuse in order to get their credentials renewed. When applying to renew a license, LPNs pay a $50 fee. According to the U.S. Bureau of Labor Statistics, the average salary of LPNs around the country is $42,490. However, like other nursing jobs, the specific salaries of these professionals depend on where they work. This section details the top paying locations for LPNs in New York. LPNs can choose to work in various professional settings, each of which has its own rewards. The following tables provide a picture of where LPNs work in New York State. The New York State chapter of the American Nurses Association allows professionals to take advantage of the benefits offered by the ANA, while still enjoying resources that are tailored to nurses in the state. The association offers publications—like Nursing Insider, The American Nurse, and American Nurse Today —and meetings and conferences that address the challenges New York’s nurses face. Members also can sign up for discounted liability insurance and receive access to professional tools like PubMed Citations and the Drug Name Error Finder Tool. All licensed practical nurses in New York State are required to get training on infectious disease prevention and control. This page of the New York State Education Department’s website includes information on what this training entails and where it is conducted. This association provides education and certifications for LPNs. Founded in New York in 1949, the National Federation of Licensed Practical Nurses promotes quality patient care by providing services to LPNs and LVNs. Members of this organization receive access to certification programs and continuing education courses. The group also provides legislative support. The New York State Nurses Association gives professionals around the state the tools they need to do their work. Some of the benefits that the organization offers include nursing education, journals with evidence-based nursing research, news about the industry, and events where nurses can build comradery with colleagues. NYSED’s Office of the Professions offers lots of information for New York LPNs, including comprehensive details on licensure and FAQs. LPNs can also find interesting statistics about the state’s nursing field, as well as scholarships, grants, and nursing programs. When considering an LPN program, prospective students can use this data to make their decision. Compiled by the New York State Board of Nursing, this site has information about the NCLEX pass rate from schools around New York.